The University of Minnesota's Jessica Hellmann speaks at the annual Climate Change Symposium. She discussed international issues about climate change and greenhouse gases. Speakers at the annual Northwestern Climate Change Symposium discussed local and international issues regarding water, energy and climate at Norris University Center on Thursday. The goal of the annual event is to raise awareness about environmental issues. 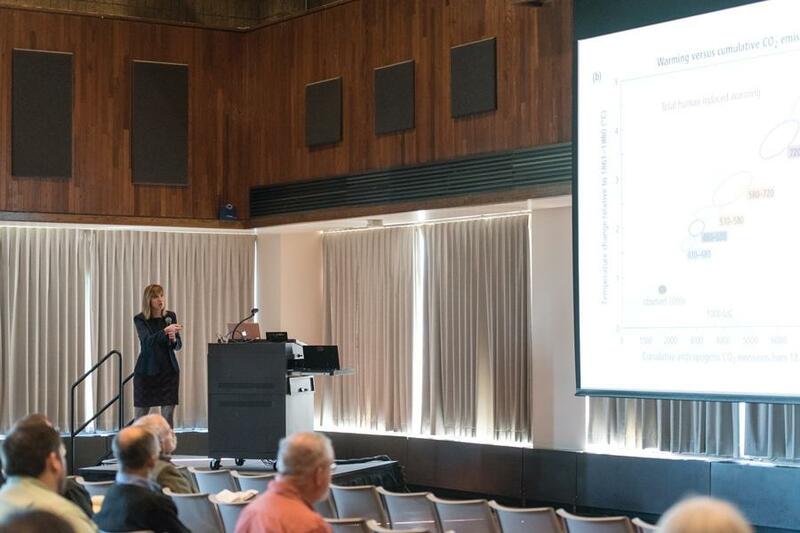 This year’s symposium, titled “Water-Energy-Climate Nexus,” was a collaborative effort between the Institute for Sustainability and Energy at Northwestern, the Department of Earth and Planetary Sciences and the Northwestern Center for Water Research. Jessica Hellmann, director of the University of Minnesota’s Institute on the Environment, discussed in her speech the 2015 Paris Agreement drafted at the COP21, an annual international conference about the environment. The agreement outlines a plan to cap the global temperature rise this century to below 2 degrees Celsius. However, Hellmann said even a 2-degree change will have serious effects on the environment. Because cutting greenhouse gases alone will not be sufficient to deal with the effects of climate change, countries must create infrastructure such as wetland and irrigation to solve water issues caused by climate change, she said. Hydrologist Drew Gronewold spoke after Hellmann’s presentation about the effects of climate change on the Great Lakes. He said the Great Lakes’ water levels are declining as a result of global warming, a trend that is relevant to the Chicagoland area. Gronewold said that, because climate change is a global issue, there is no one solution to address the problems it creates. Other topics discussed at the symposium included fracking, urban flooding and manufacturing and materials for clean water production. Keynote speaker U.S. Rep. Mike Quigley (D-Ill.) spoke about taking action about climate change in the face of climate change denial. ISEN associate director Jeff Henderson told The Daily that the symposium was not intended to be an overly-academic event; rather, its goal was to be an accessible form of information for attendees. Packman said organizers wanted to give audience members ideas on how to take action to combat climate change.